mcheka wrote: 1269 haste cap only puts VT and Mind Blast at the GCD cap, the latter which you're not using at high gear levels anyway. This means that haste is actually still excellent beyond that point. It loses a bit of value, but it's still better than crit. I'll run SimCraft later to double-check this (and to see exactly how big the effect is), but there's no real cap achievable in WotLK gear for shadow priests. The BiS just happens to tend to this value anyway, but if there was some theoretical higher ilvl gear with more haste, it'd be worth taking. I didn't run with many iterations, and I'm not sure the increments/steps in which SimCraft attempts to measure stat weights (something like 1 is too volatile due to natural variance, but something like 20 won't be right for anything between 1249 and 1269 haste), but that's pretty close. In the latter two, i.e. one with pure SP/Haste gems and the other with a bunch of SP/Crit gems, the simmed DPS was exactly the same, subject to variance. 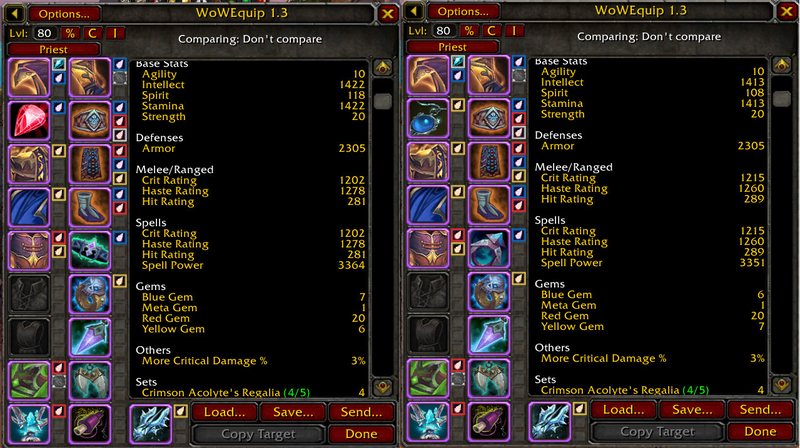 That's just more evidence that haste and crit are equal after 1269. That's the point of crit gems that i'm using. testeromir wrote: Yea ToT and Inner Focus, as crit modifiers, should be kept on SW:P. Similar for corruption mechanics for afliction locks. ToT is not a crit modifier, from what do i know its a dmg increase modifier, this is why I said that it can be a very good trick . Replace link of my old comparation with this one.